What I learnt from creating a product my clients didn’t think they needed. My focus this week is on understanding your client profiles and focusing on what they actually want. There’s a broader lesson in this that will apply to anyone who is in project management, product or content development, and that is all about how to recycle, or repurpose your content if it doesn’t ‘work’ the first time. So there are two morals to this story. 1. Know what your clients want BEFORE you jump headlong into creating something they may not actually be interested in buying, using or engaging with. There’s only one way to really understand what they want, and that is to ask them – so – ask before you create. Sales and marketing 101 right? Guess what most of them choose? You guessed it. The course. Nuts right? What that means though, is that I can feel solid about the rates I charge because they don’t just get access to me on an hourly basis – they get all my IP thrown in ‘for free’, and if they don’t have the budget to work with me at all? Then yes, they can still access the online courses and learn that way. It’s all about speaking their language, speaking in terms that will resonate with them. Do you want an online course? No. Do you want some self study materials to supplement your one-to-one coaching program so that you can save some time and money? Yes. Same content, described differently. What do YOUR clients think they need? So what can you do to avoid creating products your clients simply won’t buy? Do the research. Find out what they do and don’t want, and the language they use to describe it, then pitch at a level that is going to resonate with them. Use their unique experiences to help mould and craft a learning experience that is going to speak to them directly, challenge them and push them to grow their skills with your help. Ready to find out how to source that information? So you don’t end up with egg on YOUR face? The lesson below has step by step questions and examples to help guide you on how to create your own pre-work surveys. Profile your clients. Get the intelligence. Then use it to create a learning experience that blows them out of the water. Click on the above link to be taken directly to the Lesson. 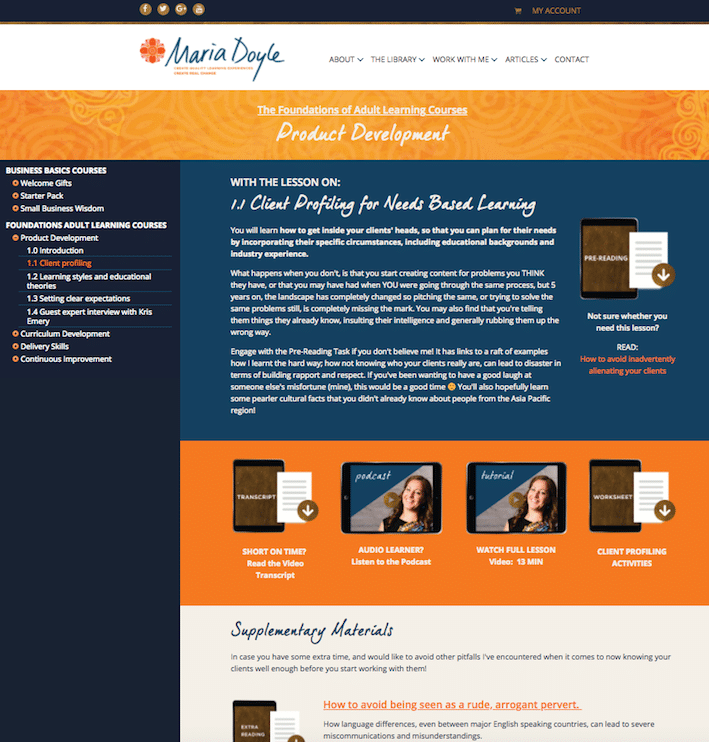 If you’re already a member of the Product Development course, make sure you’re logged in! If you’re not, you’ll be redirected to the page where you can become a member.